How will our gardens grow in 2018? What are the new trends in garden design right now? Inspiration can be found in the award-winning gardens revealed at this year’s Society of Garden Designers Awards, where some of the best landscape and garden design projects were celebrated. Planter Gardening – Bold, multi-layered steel planting systems were key features in two of the award-winning gardens at the Society of Garden Designer Awards this year. Designer Emily Erlam used blocks of angular steel planters, deep filled with plants, shrubs and trees to create a densely planted roof terrace, while Ian Kitson FSGD snaked sculptural Corten steel planters around wooden boardwalks in his design for an estuary garden, with single plant specimens in each. Monochromatic green gardens – Lush, all-green gardens were evident in two of the award-winning gardens designed by Robert Myers MSGD and Matt Keightley MSGD this year. The designers have cleverly used contrasting foliage and textures to add year-round interest to their design and created gardens that are as visually pleasing as they are calming. The mixture of monochromatic foliage creates a perfect backdrop to the bold spherical sculpture in Robert Myers’ Magical Garden at Hampton Court and is the ideal complement to the soft grey landscaping and reflective pool in Matt Keightley’s contemporary garden. Specimen pot planting – Garden designer Jane Brockbank MSGD devised a smart new way to display favourite plants by bedding them in individual pots and elevating them centre-stage on a bespoke bench. 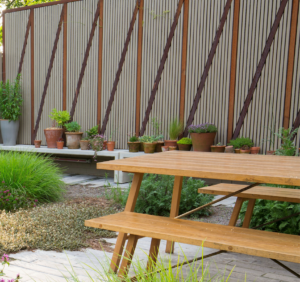 Set against a custom-made wooden fence, these eye-catching garden exhibits added instant impact to her contemporary garden design which was joint winner in the ‘small residential garden’ category in the Society of Garden Designers Awards. 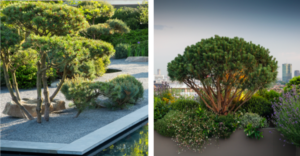 Pine takes centre stage – Pine was the feature tree of choice in the winning gardens designed by Matt Keightley MSGD and Emily Erlam at the Society of Garden Designers Awards. Cloud-forming dwarf Mountain Pines (Pinus mugo) planted deep among Mediterranean-style planting were used by Emily Erlam in her design for a London roof garden, while Matt Keightley chose bonsai-form Scots pines (Pinus sylvestris) and the slow growing Pinus sylvestris wateri to add year-round interest to his modern gravel garden. Deconstructed topiary – Horticulture met art in the winning gardens by Matt Keightley MSGD and Debbie Roberts MSGD of Acres Wild where the precise placement of sculptural box ball (Buxus sempervirens) and mound-form pines (Pinus sylvestris wateri) were used to punctuated the garden layout and draw your eye in.